Happy (day after) Mama's Day! We enjoyed a homemade (by Jared) breakfast of cinnamon rolls and eggs and some mighty fine mimosas. I got in a little more gardening and a trip to lowe's for some fun additions into the yard (black jack dwarf fig tree for one). I took Griffin with me as Jared was trying to catch a little nap and Bird was taking hers. Unfortunately I had to walk around the store for 45 min to get Griffin to settle into the sling. Then I realized I had forgotten my phone. After picking up some plants I was ready to go but of course Griffy was peacefully sleeping and I had to stick him in the car again (just like his sister when she was a babe, he's not a fan of car rides). Thankfully no one missed me at home (do you feel naked w/o your phone? I sure do!). Jared managed to get our ebay find up on the wall in the kitchen. We really like it! It's a vintage train rack from the New South Wales Railway. 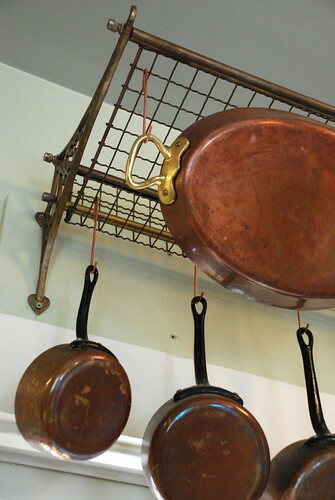 We used to hang our pots on an adjacent wall and while they looked cool they were in the way and Jared often banged his shoulders against them while passing. I don't know why we didn't think of this spot before but it feels good and look, there's room for more pots! :o) Have to tell my parents...they got the other ones for us in France at a thrift store. We had so much fun at those thrift stores! 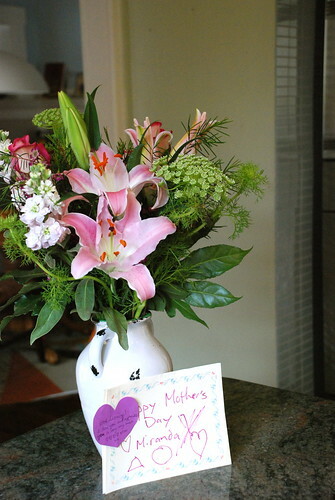 ps: this is what was waiting for me on the counter on Mother's Day. Such sweetness.